The most important lesson history can teach us is: The unpredictable is the only thing that is predictable. Looking back to the past should not be used as a forecasting guide to the future. Expecting events to repeat themselves in order to profit from this knowledge is a loser’s game. Being a former history teacher, I can look back at many events from the past that would only be predictable to a Monday morning quarterback. Who would have predicted Hernan Cortez could have conquered the mighty Aztec Empire with 6 million people when he arrived in 1519 with 450 soldiers? Would you have bet that the often shoe-less, unpaid American army would defeat the British Empire after seven long years of warfare? 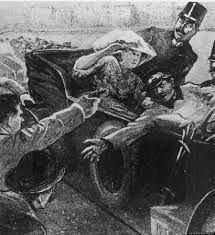 How about betting that the assassination of the Archduke Franz Ferdinand of Austria-Hungary, by a Serbian terrorist in the small nation of Bosnia, would lead to a war that would kill over 10 million people? During the Roaring Twenties, would anyone have predicted that millions of Americans would be lined up a few years later for free bread and soup; their only meal of the day? Who in their right mind would have believed the Cold War would have ended without a single shot being fired? Who would have believed, on that glorious fall day in 2001, that we would witness two of the most famous buildings in the world crumble on T.V.? The point is studying history IS enormously valuable. It’s just not for the reasons that many think. History’s value is that it teaches us that anything can happen, especially things that are seemingly impossible. There are few more important traits for a good investor than being humble. A true student of history understands that empires have crumbled from the spread of small microbes that fatally infected millions. Knowing this, one would have to be the king of hubris to believe their portfolio is immune from uncertainty and random events that they have no control over. Morgan Housel hits the nail on the head when he looks at the record of investors who worship at the throne of linear history. It is bad enough that history is being de-emphasized in many schools because of state exams that only cover Math and English. We are dealing with a double-barreled problem. Students are not learning enough about the subject and, when they do, the main point about the lessons of uncertainty are often glossed over. This is not a positive for aspiring investors. Using history as a toolbox for confirming what you already think or its predictive value for future events is a very dangerous game to play for investors. If you don’t believe me, go ask the Aztecs.